"Great News, We Hired Our Frontend Developer!" That great news was from Suzanne. A recent Featured Job Post customer. She had two job requirements. 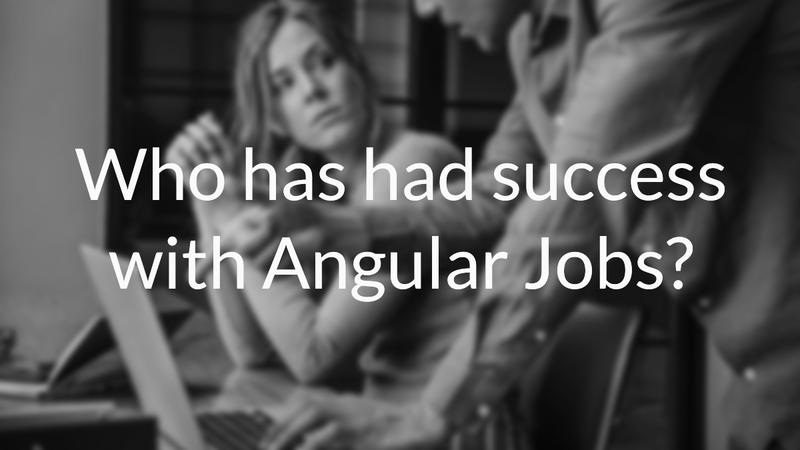 Suzanne purchased two Featured Job Posts from Angular Jobs. We advertised her jobs on industry hot spots. In less than one month, she had hired! When was the last time you hired that fast? Nick leads a busy development shop in New York City. He frequently needs to expand his team to keep up with demands. Why does it work? Developers want skill-specific jobs. And we place jobs conveniently alongside industry resources. We know that going to where the developers are is the key to generate interest in your job. Twitter has become a leading source for sharing. Technology changes so rapidly that developers have to rely on Twitter. The Angular News Twitter account attracts top developers that want to know about the latest updates. The beauty of Twitter is that followers will Retweet or Mention their friends. Referrals!! You can sponsor content from software industry leaders. This content gets shared and re-shared on social media. These partnerships work. Identify parts in your job or company that would tie in well with content creators who write about technical topics. Does your company use interesting new technologies? Can you better explain how to use an open-source project by writing a blog post? Cross promote content that your company has written. The Muse publishes articles to their audience of over 5M readers. How can you partner with them to share your company’s culture? Focusing on how to get your job in front of passive candidates is a major key to help drive referrals. Passive candidates are also more likely to make a referral than take an interview. These types of referrals happen all the time.